Our velvety-smooth Nitro Cold Brew served cold, straight from the tap, is capped with Cascara flavored Cold Foam for subtle notes of dark brown sugar. Our most craveable cup of Nitro Cold Brew yet. 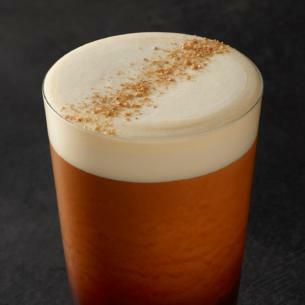 Brewed Coffee, Cascara Cold Foam [Milk, Cascara Syrup (Water, Cane Sugar, Coffee Cherry Extract, Organic Coconut Sugar, Citric Acid, Xanthan Gum, Potassium Sorbate)], Vanilla Syrup [Sugar, Water, Natural Flavors, Potassium Sorbate, Citric Acid], Cascara Topping [Sugar, Coffee Cherry Extract].